First and foremost, I’m a big fan of the safety that the seat gives my child. It’s clear, both in the way it looks and feels that it’s a good and solid seat. It’s easy for the child to get into the seat and buckle themselves up. I have to admit that the pillow for the vehicle belt has annoyed me a couple of times because it needs to be adjusted and can be in the way. However, my daughter who is 5 years old has not complained about it once during driving. I just have to get used to that it now takes some more time to fasten her because of the pillow on the vehicle belt and the strap between the legs, but when that means greater safety, it’s definitely worth it. What is your favourite function? I think the function of adjusting the height of the seat/headrest is super smart and easy to work with. I like almost everything about the seat! I think it’s small and flexible but still very solid and robust. In addition, my daughter is very comfortable in it! That’s probably the PAD+. My daughter experienced that it was sometimes in the way. I think the function of holding the lapbelt in place is good, but when the child buckles herself up for unbuckles herself, it’s a bit difficult, she’s having trouble getting it to open. BUT this doesn’t bother us that much. The ability to adjust it if there are children of different sizes travelling in it. The flexibility of the seat it’s one of my favourites. As well as the side impact protection – that’s probably my favourite. It feels very safe. No, I think you get everything you need, and more. You are awesome at what you do. Despite the “negative” things I entered, the overall score will be 10 points. The good things weigh higher than the negative. We would buy this seat at any time and are already recommending it to all of our friends. We also think that the price is justified considering all the research and development work that is in this seat. Thanks a million times again that we got to test this fantastic seat!!! How easy it is to install, the height adjustment for the head is very easy to adjust. My son is autistic and the strap between the legs is a huge selling point for me. We like pretty much everything about the iZi Flex Fix i-Size. Starting with the design – despite the head and side cushioning, the seat does not feel bulky. Also the cover colours are very nice. We have it in Sea Green Mélange, a nicely decent colour. Also the PAD+ is great. As chest and chin protection it is an important part of the seat and our son thinks it’s very comfortable. Also to help cushioning the head when he gets a bit tired. In the beginning we thought that he might be disturbed by it, but he accepted it immediately. Very important for us: the vehicle belt guiding both in the neck area and over the hips. This way we can be sure that everything is positioned correctly and our child is protected in the case of an accident by being held in the seat by the vehicle belt. Finally we think the two recline positions are fantastic, especially on longer journeys our son really likes not sitting quite as upright. We especially like the compact construction that allows you to place several seats next to each other. When having three children, this is an important criterion. Especially the detachable SIP bumper give you flexible space without reducing safety. Thanks to being approved from 100-150 cm, the seat covers the whole time after the rear facing toddler seat until the end of having to use a child car seat, independent of the child’s weight. 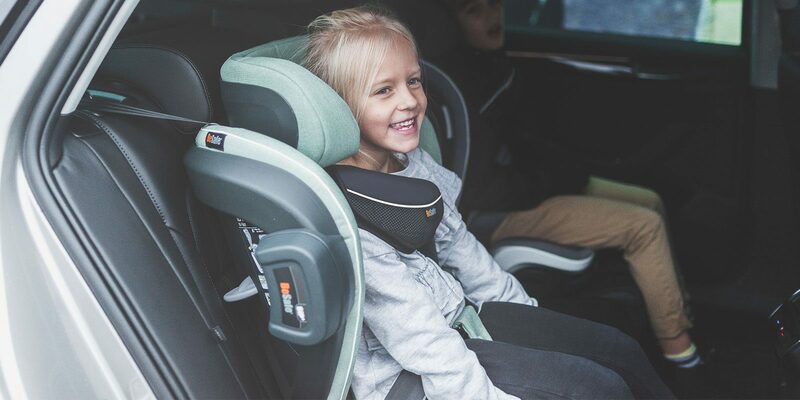 With its ISOfix connectors, the seat is also attached to the car when no child is sitting in it, so that you don’t have to buckle the seat up with the vehicle belt or have to place it in the trunk. We give 9,5 points for the iZi Flex FIX i-Size. We think it’s a great seat and very importantly: our sons really enjoys sitting in it. Only the price made us take away 0,5 points. Thanks a lot to BeSafe for selecting us as a test family. We are still extremely excited and happy, as the seat is really great and our son simply enjoys using it. The introduction by Dominic from the BeSafe team was also very sympathetic! I love that it is lightweight, slim fitting and that it provides a great belt fit on my 5 year old. I like that it has been subjected to isize testing also, with the superior test dummy. I like that the torso containment on the flex is deeper compared with the upfix. The seatbelt is easy for my son to fit correctly by himself. The SIP bumpers are tricky to get off and on and the manual is slightly ambiguous as to where the chest pad should be placed. I only learned the correct placement during my meeting with your rep Paul. The chest pad is bulkier than I would like, in saying that though – its bulkiness doesn’t bother my son. I’m not a big fan of the headrest on the flex, I find it to be small and slightly lacking containment compared with the upfix. The lap belt position and guide is fantastic! It really gives a perfect fit across the pelvis on my 5 year old. The SIP bumper and block offer a lot of reassurances in case of side impact. The gentle slope of the bottom of the headrest is great for catching sleepy floppy heads. I was really excited to be chosen to test this new HBB for you. I will admit that when I first unboxed it, I wasn’t as impressed as I expected. You need to understand that I was directly comparing this seat to your upfix X3 as that was the seat my son was in prior to the flex arriving. In comparison, the flex really doesn’t feel as sturdy as the upfix. The sidewings on the flex are mobile and feel less secure than the upfix. I specifically chose the upfix because of its SIR and was disappointed to learn the flex does not have this feature. After the consultation with your rep Paul, I was reassured that the movement in the side wings were in fact an energy absorbing design feature. It did take a further week for me to be fully comfortable with my son being in this seat just because overall it does feel less sturdy than the upfix. I do wish besafe had managed to incorporate the SIR feature on the flex but I understand that having that feature made the seat come out of the isize crash test envelope and so a different solution had to be created. Over all I think this is a great HBB, with its lapbelt guide, chest pad and SIP bumpers/block, and the fact that it’s isize compliant is a major plus in my eyes, it just takes a bit of getting used to and some research to understand its features to be fully comfortable with it. I have both the flex fix and upfix installed in my car currently. I’ve allowed my son to choose which one he wants to sit in. His choice generally comes down to how much time we have to get our belts on and go. If we have ample time, he chooses the flex. If we are in a hurry it’s the upfix. More and more though he is choosing the flex fix and I think that speaks volumes. Being able to remove side impact protection so middle car seat can be used. Fabrics are great quality. Carry handle is extremely useful. Crotch strap and chest pad help keep my child secure. Adjusting the height is super easy with the knob on the side, much easier than any other high back booster we have owned. Height adjustment is great, so easy! The crotch strap and chest pad are great too, my 5yr old feels secure using them. The car seat looks lovely, we have the grey one and you can tell it’s a good quality seat. The car seat is narrow – not quite as narrow asI’d anticipated though it makes getting an adult between 2 car seats feasible in a Passat Estate. My daughter finds it very comfortable and likes the red colour. I like it because I wanted a seat that was as safe as possible and that my child was happy to sit in and this ticks both boxes. The detachable side parts don’t seem particularly secure and can be accidentally knocked off by children climbing into the seat. The ease of installation and removal from the car. It’s relatively light and I’m going to be able to easily transfer it to friends cars if they’re giving my daughter a lift. We’re really happy with the seat and my younger daughter is keen to have the same one in red when she is big enough. (She’s 98cm and almost outgrowing her stage 1 seat) We did find sourcing the seat in the sunset melange colourway difficult and it would be great if the major retailers that are stocking it in black / navy etc also had this one. The seat is easy to get in and out. It feels solid yet comfortable. The option to recline is great. My little boy actually fell asleep in the seat which never happens in the car and his head didn’t fall all over the place. After looking at other seats I feel my son is more protected in this seat than any other and we like the belt that pulls the strap lower on his body so it doesn’t cut into his stomach. Only niggle is the sipp sometimes comes off the seat if knocked accidently..